Memory Bears, Keepsake Stuffed Animals, Pillows, Warming Pillows, Tea Cosies, and other keepsake items created from your loved clothing make wonderful memorials to comfort the family and friends of a loved one. These one-of-a-kind keepsakes also make a great retirement gift, made from uniforms or scrubs. 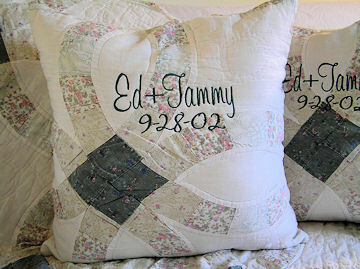 Or consider a unique shower gift, maybe made from a baby blanket, pajamas, or maternity dress. A parent or young person would treasure a graduation present, using logowear, sport shirt, scout uniform, or other memory-filled clothing. We have personally experienced loss of loved ones, and have also personally experienced the comfort of keepsake stuffed animals, warming pillows and other items. We love creating these for you and assure you that we will treat your loved clothing with care and respect. We are honored by your decision to entrust your loved clothing to us. Now available at Sew Memories!